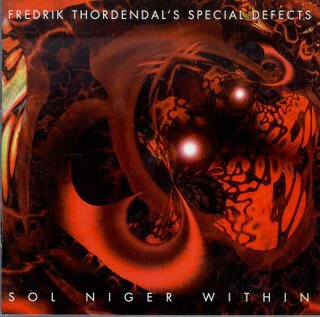 A special treat today; a rarely discussed album from one of the main members of the math-metal band Meshuggah: Fredrik Thorendal’s Special Defects. Basically amounting to a forty minute song in several movements, broken up into twenty-eight “songs”, with the shortest being fifteen seconds and the longest lasting roughly three and a half minutes. The average “movement” lasts about one and half to three minutes, as the main theme of the album slowly shifts, occasionally making sharp left-turns into guitar soloing or jazz-influenced guitar and/or saxophone excursions. The lyrics are highly complex abstract constructions, mainly concerning themselves with metaphysical spiritual concepts, Buddhist principles, alien abduction phenomenon, disease, the nature of ignorance, mental paradoxes, and the nature of the universe. In a somewhat fitting manner, the majority of the vocals are likewise distorted using vocoders or digital studio manipulation. Also inserted in the linear notes are quotes from Plato, Samuel Beckett, William Burroughs, the Marquis De Sade, and other historical luminaries. Obviously, this is a massive album, and not one to approach lightly. Due to the fact that the majority of the “songs” flow into one another, there are very few moments you can take of this album by itself. Even for me, much of the album’s lyrical content goes way over my head (and perhaps that is what they intended). However, the lyrics are really secondary when considering the great technical musicianship exhibited in this record, elements which would later be in evidence in future Meshuggah records. Album highlights include the incredible guitar and saxaphone solos on “Zeta 1 – Reticuli” and “Zeta 2 – Reticuli” (respectively). So, if you are interested in Meshuggah, or jazz-influenced metal with a highly developed musical and lyrical sense, peppered with some of the best guitar improvisation the genre has seen in a while, then check out this record. If, however, you do not prefer your music to leave you scratching your head in wonder, then you had best look for something more mundane. Order: It seems that is difficult to find the record at a reasonable price. Amazon.com starts around $150.00. Good luck finding it! ~ by John Lithium on October 16, 2006. This entry was posted on October 16, 2006 at 8:33 pm and is filed under Music For The Rest Of Us Archive, Uncategorized.You can follow any responses to this entry through the RSS 2.0 feed.You can skip to the end and leave a response. Pinging is currently not allowed. Next: Sunn O))) / Boris "Altar"